[UPDATE 2] I’ve written much more about this contract under the next post entitled HCS Recording Children: Follow Up. You might want to check it out. [UPDATE] I have been reminded that the board did have a presentation on February 19, 2015 concerning the LENA Foundation contract. At the conclusion of that presentation, there were in fact a a few questions asked by board members. Mrs. Ferrell asked if we were really the first school district selected to participate in the LENA program and if they had evidence that this program would help. The answers were yes, we’re first and no, they have no evidence. Mrs. Ferrell also asked how many families would be involved. 12-15 for this pilot. Again, this is not in agreement with the LENA website cited below. It was also contradicted by Mr. Davidson himself who said that the system is designed to get mothers to talk to their babies by “actually using words.” If they are tracking mothers who “actually use words” with their babies, then again, they are recording the actual words being used. Mrs. Wilder asked if this would be like a pilot that would grow every year? The answer was yes. They are planning on expanding this program after this year. I apologize to Mrs. Ferrell, Ms. McCaulley, and Mrs. Wilder for stating that they did not ask any questions about this plan. They didn’t ask any questions on the night they approved the plan, but they did ask a few questions a month earlier. They did not, however, actually research the answers that they were given a month ago to see if the answers were accurate or not. Ms. McCaulley, in an email to me tonight, claimed that she would follow up on these discrepancies. Sadly this follow up is occurring after the board has approved the contract. I also apologize to my readers for not recalling this earlier presentation. The presentation did not, however, alter my understanding of the program as presented below. I remain convinced that this recording device will be recording actual conversations between parent and child. If not, a transcript would not be possible. During the Huntsville City Schools Board of Education meeting last night, the board, without asking a single question last night, approved Dr. Wardynski’s recommendation for a 24 month contract with the LENA Foundation for $93,500. coaching of young parents to make sure that their interactions with their kids are going of a level where the kids are not going to suffer from a 30 million word gap. That they’ll arrive at school with a rich vocabulary . . . When the board president, Laurie McCaulley asked if the board members had any questions concerning this contract, not one member had a single question last night. Ms. McCaulley did not ask for questions from the public last night. The contract states that this program of getting young parents to record their children will begin in May 2015 and will have a “class” of at least 50 children. The way the recording will work is not clear, however. The LENA recorder cannot play back and is designed only to connect to a computer for processing. No one listens to the recording, and it is erased after the computer processes it. The computer processing does not recognize words or their meaning; it only counts them. The processed ‘count’ data is known as metadata and is used by us to produce reports that tell you how much you are talking to and with your baby. The reports include information on counts of words, conversational turns, and TV/electronic minutes. Q: Does LENA help with transcription? A: Absolutely. The LENA software automatically segments and identifies the audio source (e.g., Key Child, Adult Male, Adult Female, Other Child). And when used with Transcriber, free software from http://sourceforge.net/projects/trans/files/transcriber/1.5.1/ it can help you substantially reduce your transcription time. The reports act as a roadmap and allow you to see where there is activity, saving you from having to listen and wait for something to happen. If you’re looking for specific content, the 5-minute view allows you to listen to the audio within the LENA software. In other words, it would seem that the recorder records far more than just, “metadata” as their legal section claims. The recorder is in fact recording conversations and LENA will happily help anyone transcribe them for their record. Thus, this district approved program will be recording the actual words you say to your children should you choose to participate. Dr. Wardynski, a self-proclaimed engineer, loves data. He believes that data will save the world. He believes that data can actually replace humans. Thus, it is easy to see why this “solution” appeals to him. First, it’s run by a former defense contractor. No one knows more about how to solve every problem known to humanity than a defense contractor. Second, this is a program that brings in private companies and software to address a human problem. Computers are, after all, much cheaper than humans, and they don’t ask difficult questions. What he fails to recognize, despite his “years” of educational experience, is that, while important, data is not in itself a solution. Simply recording how often a parent speaks to a child and then sending them a text message to speak a little more (which is the plan according to the LENA contract), will do little to address the 30 million word gap. And honestly, the reason this 30 million word gap exists in the first place is not because parents don’t know that they should speak to their children. The 30 million word gap exists because the parents of children born below the poverty line cannot afford to be at home with their children to talk to them. Sending a text to these parents, or requiring them to attend a district sponsored class, isn’t going to address the problem of poverty one bit. This contract calls for the recording of children/parent interactions beginning in May 2015. The program is designed to work with children from ages 24 to 48 months. The district is working with “new parents and community sponsors” to send a text message to parents reminding them to talk to their new children. Helen Scott, Director of School Readiness, (the Pre-K program) will be overseeing this program. Huntsville City Schools will be serving as a beta-test site for rolling out this program. Once again, the district is completely fine with using our children as guinea pigs for a start-up corporation’s benefit. Will the district attempt to require other students who receive, let’s say, Speech Therapy as a part of their IEP to also participate in this recording program? And finally, what parents, in their right minds, would ever consent to allowing conversations with their child to be recorded? To the final question, I have absolutely no answer. While addressing the 30 million word gap is certainly important, sending a text message to parents to remind them to talk to their children is a non-starter. To the other questions, I also have no answer. You see, I am not a board member, and I was not asked during the board meeting last night if I had any questions. And not one single board member asked a single question last night about this plan to record private conversations between parents and children either. It’s so nice to know that they are looking out for us, isn’t it? Once again, Dr. Wardynski has board approval to spy on our children. We might as well just let the district adopt our kids. This is disgusting. Wardynski’s concern for “low income children” is touching. This sounds like a new and improved SAFe program to me. Since “The computer processing does not recognize words or their meaning; it only counts them,” the parent only has to say “All Hail Wardynski” 10 million times and all will be well. If this program tracks conversation, it might be useful to remember that infants don’t talk. To converse generally implies not a monologue, right? Even by 2 most kids are not forming complete sentences. Talk is one thing. Exposure to language is quite another. Again, talk is not the same as language. By the usual definitions of the words here, “talk” and “conversation,” reading to your kids would not apply. I believe firmly that reading to your kids matters. A lot. Chattering, nope. There was so very much wrong with that article, it was difficult to keep track of. I’m guessing telling someone — a parent, teacher, child — to read for pleasure is not allowed. There’s no money to be made in making that suggestion. I recently read a very interesting article on speech development. And it indicated that the best outcomes were when parents speak 10,000 words a day with child. It needs to start well before the child is verbal, and it needs to be rich language – not just “look at the kitty” but “look at the kitty. doesn’t he have a big,bushy tail. look at how soft & fluffy his fur is.” Reading to your children is important, and need not be limited by a parent’s literacy skills. They can take a picture book and invent a story to it,describe the pictures, etc. And it need not be English – is a parent speaks a foreign language, then use that language. So it is an important element of childhood development. However, isn’t this what Head Start is for? So rather than spending money on setting up its own program, wouldn’t it be better for the school district to work with the local Head Start office to ensure Head Start is maximized in Huntsville? And any other pre-exisiting programs that are already out there? Also, since Wardynski was in CO before Huntsville, I find it very interesting that he recommended a CO company. I wonder how Wardynski came to know about this company. And why does the district award so many sole source contracts Surely this outit in CO isn’t the only one offering these kinds of services. My personal opinion of this entire concept is it is a load of crap way to funnel money away from the PK-12 students of Huntsville and funneling it to a company outside of Huntsville, Alabama. 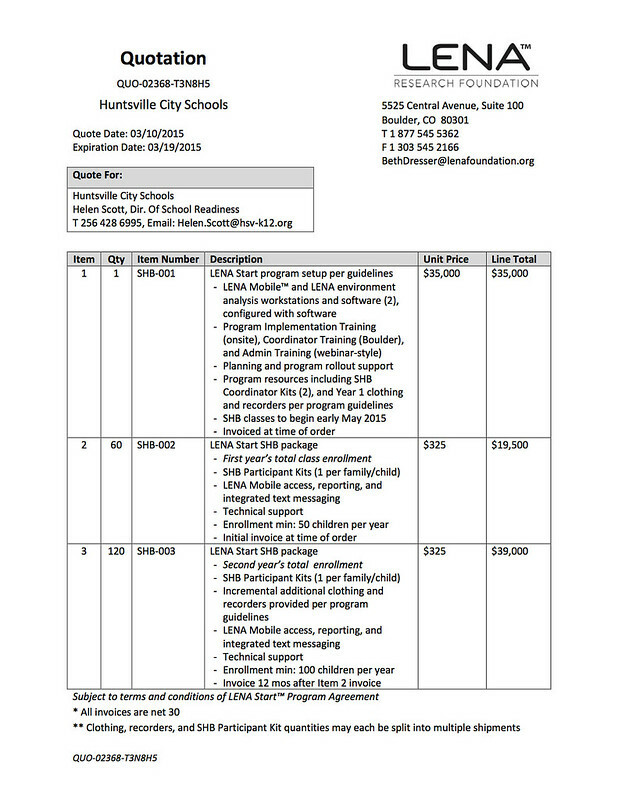 Since when is HCS so wealthy that they can use monies, that should be providing teachers and materials for students within the system for whatever outside the PK-12 agenda. Also, I would like to know where these children are going to come from? How will they be selected? How will they be found? Will they be approached at birth at the hospital? If I understood correctly, this will target young parents in low income households. Will there be offers of rewards for participation? A years worth of free diapers if one agrees to participate in the program, assistance with rent or perhaps a financial stipend? Honestly, if you are a 15 or 16 year old single parent, incentives like this would likely convince you to participate. Also, what happens when incidents of abuse are recorded on this device? They aren’t listening, right? They can’t report it, because they didn’t hear it, right? Someone on the board needs to open this matter back up and retract this approval. All parents, young, not so young, no matter what income, need to stand up and put a stop to this type of intrusion. Funny how they will fund a study to justify spying on low income students/parents but they won’t fund a health risk assessment and air quality analysis to judge how building a school less than half a mile from an active rock quarry will affect low income students learning abity. Is it really the school’s charter to fund studies like this? What I see is yet another business relationship between Wardynski and private enterprise, both I’m sure will benefit from this. This is following in the dreadful footsteps of Common Core. I can only think back on when I went to school and how we addressed education. Failing schools? Really? Schools don’t fail, students do. Sure you can build beautiful new schools and supply them with the latest tech devices, but if the kids don’t have the desire to achieve, then it is all a waste of money. You want to fix the school? Then sit down and identify why it’s “failing.” Stop getting rid of good teachers and stop protecting the bad ones. Employ a zero tolerance policy. Prior to the school year, every student and at least one of the parents must meet with school administration for a mandatory discussion. Explain the schools policies (instead of sending home the documentation which almost never get read), have the parent sign an agreement of what’s expected, and then build a file on every student which follows them until they graduate. Inform them of opportunities, assistance, and anything else they need to help the student through the school year. But also let them know the consequences of bad behavior, rampant absences, or consistent failing. Our schools today act more like an assembly line, preparing students to take tests instead of actual learning, with its ultimate goal to push them out into society. Remember when America use to be on top when it came to education? Take a look at the minnows we are graduating today and it’s no wonder we’re sliding down the scale of school achievers. Sorry for the rambling, it’s just that I see so much wrong with our education system and the “business-minded demons” who run it.